Last week The Red Menace and Tiny Doom gave you a geek-based roundup of things to do in Boston proper while you are in town for Boston Comic Con. This week, we encourage you to seek out adventure and explore a little farther. Jump on the MBTA Red Line (you can do this at South Station) and head across the Charles River to the Cambridge/Somerville area (you may recall this train ride from Good Will Hunting). Here you will find lots of comic shops, universities, and “squares” like Central Square, Harvard Square, Davis Square, Union Square.... you get the picture. Just think of a square as a concentrated place with a lot of cool stuff. While not all squares are created equal, we will direct you to fun and MBTA accessible ones. Pro Tip- Do not even think about trying to park your car in Harvard Yard. (Davis Square) Clearly, we feel strongly that Comicazi is one of the best comic shops in the area - it's our base of operations, after all. But in all sincerity, we've been to many shops around the country - even the world, and Comicazi remains one of the best we've seen. 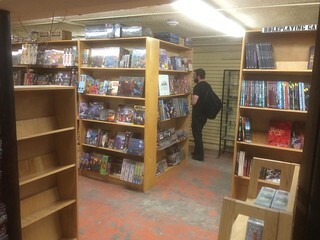 Partly it's due to the space, which is able to accommodate a robust selection of trade paper backs, traditional comics, games, and toys and still have room for events. Partly it's due to the fact that staff are wonderfully helpful, willing to find what you need, make special orders if they need to, or chat about something you're curious about. But mostly it's due to the amazing, inclusive community of people who work and shop there. Any time you drop by there's an opportunity for a meaningful conversation about the books, toys, and games we love so much - and that's pretty darned special. (Union Square) Hub takes a bookstore style approach to organizing their comics, organizing by genre to help you find what you love, or explore new areas. But what really makes Hub unique is how they engage with the local comic artist community, which is thriving in Somerville. To tap into this Hub often arranges themed art shows, including the Batman themed "Dark Knight on a Dark Night", and the recent "She Can Do It" show which highlighted women superheros. While Hub is not located directly on a T line (that's the subway) it is still accessible via public transport. Check out their "Directions" page for details. (Central Square) Around for nearly a quarter of a century, Pandemonium is one of the best places for science fiction fans we've ever seen. They carry a unique and detailed selection of books and magazines - the latter being the part the really turned the head of one of the writers of this blog. There are so many terrific sci-fi short stories out there, but they're often only available in magazines and journals that your typical bookstore doesn't seem to carry. Luckily, Pandemonium is far from your typical bookstore. They also have a very comprehensive selection of games and space for gaming, and they organize some wonderful events in Central Square, including Geek Central and the Game of Thrones dinner we wrote about way back when. (Harvard Square) - Though located pretty close to the heart of Harvard Square,The Million Year Picnic is a bit tucked away. But that can be pretty nice if you are looking to browse through the myriad books they stock. 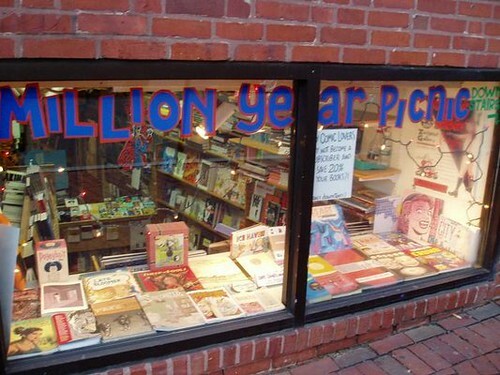 And The Million Year Picnic is a store that fits a big selection of books into a not overly big space. The selection can make it feel bigger than it is, so it's kinda like the T.A.R.D.I.S of comic book stores, but maybe a bit more cozy. If you can't find what you are looking for, ask the staff, they are happy to help. I think if you asked around, area fans would say this store feels the most old-school, which makes sense since it's been around since the 70s'. 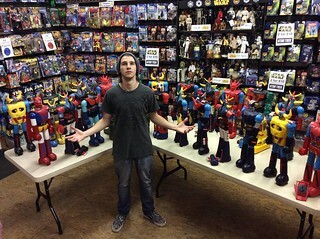 That's a pretty great feat in comic shop ownership! (Harvard Square) Take the Red Line to the Harvard stop, stroll through Harvard Yard and head to the Museum of Natural History. Here you can see the famous glass flowers, tons of taxidermied animals, skeletons, and the geological gallery with lots of minerals and gems. 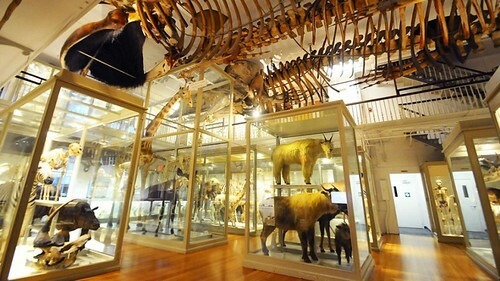 There are other museums on campus too including the Peabody Museum of Archeology and Ethnology. It's great as well, but if you are on a time crunch, the Natural History Museum is the Ladies' favorite. Tip: Non-Harvard students get a discount, so bring your ID. If you have a Harvard ID, you and a guest can go for free. You'll need a car for this one - it's a bit outside of the city in Lincoln, MA. It's well worth the trip, however, if you do have vehicle access. It's The Red Menace's favorite art museum, and always exhibits innovative and exciting contemporary art. Even better, the grounds of the museum are a 30 acre sculpture park, allowing for a surreal stroll in the sun or a picnic under a tree covered in glass eyes. As an added bonus, the DeCordova is just up the street from Walden Pond - visitors looking to really stretch their legs and get some time out in nature to recover from the con could easily do both in one day. (Central Square) Like we said, squares and universities. While you are on this side of the river you might want to check out the other well known Cambridge based university, especially if you are into science, math, and all things technology. 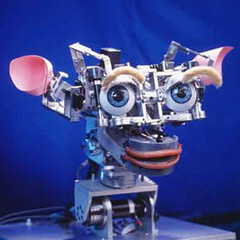 The Massachusetts Institute of Technology (MIT) has a museum that highlights all these things. You can see exhibits on robots and artificial intelligence, holography, and even a collection of nautical models that outline the history of ship building. This is another one you will need a car for. If you every watched Mystery! on PBS or have read The Gashlycrumb Tinies, then you're familiar with Edward Gorey's work. 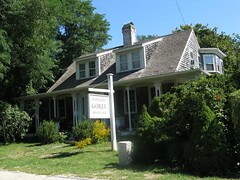 The Edward Gorey House is actually a home Gorey lived in that was converted to a small museum after his death in 2000. While you tour Gorey's home, you get a chance not only to see his work, but to learn more about is passion for animal welfare. Keep your eyes open and be sure to participate in the scavenger hunt which has you seeking out homages to all the Gashlycrumb Tinies hidden in the home and on the grounds. Note: The Edward Gorey House is on Cape Cod so don't even attempt trying to go on weekend, unless you love sitting in hours of traffic. Finding food on this side of the River is much easier. Each of the squares have great places to eat and we are tossing out a few of our faves (with varied price points). Machu Picchu Charcoal Chicken and Grill 25 Union Square, Somerville- (Union Square) Made the trek to Hub Comics and looking for a bite to eat? Just down the street is this little restaurant, home to some of the best grilled chicken you'll ever have. There are actually two Machu Picchu Peruvian restaurants in the square - this is the more casual location, while its sister spot across the street is more fine dining - but the chicken is outrageously good with perfectly crisp, salty skin atop tender, perfectly seasoned meat. The prices are also ridiculously good - $10 will get you half a chicken, fries, and a salad. Try the chicha morada, a purple corn drink, along with your meal. Pepe Bocca 414 Highland Avenue, Somerville - (Davis Square) Located right across the street from Comicazi, this Italian specialty grocery also has a fantastic assortment of sandwiches, pizza, and other treats to eat at their tables or out in the square. The focus is on the house-made breads and baked goods, but the arancini, egg plant parm, and other entrees are just as good - and the prices are quite reasonable. Crema Cafe 27 Brattle St., Cambridge MA - (Harvard Square) If you are in Harvard square and you are looking for a cafe that is not Starbucks check out Crema Cafe. Here you will find high quality coffee, lattes, lemonade, and the bakery selection is top notch. They also offer up super good soups, salads, and sandwiches. Be sure to ask about the homemade sweet potato chips! West Side Lounge 1680 Massachusetts Ave, Cambridge - (Harvard Square) While Harvard Square is the closest T stop, West Side Lounge is actually located a few blocks outside the square, down Massachusetts (Mass) Ave. This makes it a little less packed, and a little more neighborhoody. It's open for dinner and brunch and is a favorite with us Ladies for the seasonal cocktail menu and the cozy menu. The Beetle Juice sounds strange, but it's delicious and lovely. Entrees are less than $20, and do NOT leave without having some Parmesan truffle fries. Tip- Location wise, this would be a good place for dinner after visiting the Harvard Museum of Natural History. We hope you found this guide handy. If you have questions, please ask either in the comics or tweet us at @TinyDoomLoC, or @EMMcGrath. Even better, come visit us at the Bad Kids Press table at Boston Comic Con. We love living here and want to help you love it too! One more thing before you go. The Ladies are going to be giving away a 1-day pass to Boston Comic Con! The contest will happen on our Facebook page so please Like us there for more details.